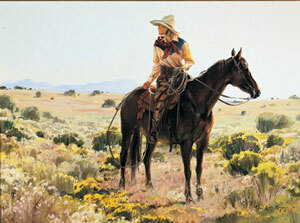 When two Western artists live together, paint together, and show together, their names become almost as one. So it is with Terri Kelly Moyers and her husband John. Not only do they work side-by-side, their works often hang side-by-side in prestigious galleries and at shows. Almost everything the couple does is in duplicate, except the painting itself. When it comes to her art, Terri Moyers is a singular sensation. “We both paint the West, but that’s a pretty broad statement,” Moyers says. Both paint landscapes—from the Canadian Rockies to the Sangre de Cristo Mountains near their Santa Fe home – and both paint wildlife and ranch scenes, but they paint them differently. 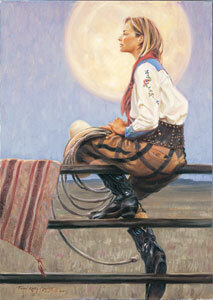 And, while John likes to paint Native American men, Moyers prefers to paint Western women. “I enjoy painting women,” she says. 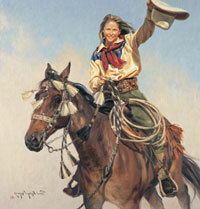 “I feel women had a major role to play in the West and maybe that hasn’t been recognized as much as it could be.” More often than not, Moyers paints working cowgirls – some in skirts, others in chaps, most on horses and in cowboy hats. Her cowgirls seem to be having fun, and Moyers seems to be having fun with them. Moyers has reason to be pleased with herself as a woman in a male-dominated field. 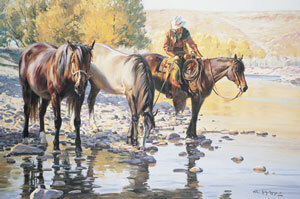 Her many honors include the Frederic Remington Award and the Nona Jean Hulsey Rumsey Buyer’s Choice Award, at the Prix de West Show both earned in 1996. Late last fall, the prolific painter was busy preparing for several upcoming shows, including one at the Forbes Building in New York City in January, a two–person show with John in Scottsdale in February, and the Masters of the American West Show at the Gene Autry Museum in Los Angeles, California, also in February. Moyers started drawing animals—horses in particular—when she was a young girl growing up in Calgary, Alberta, Canada. 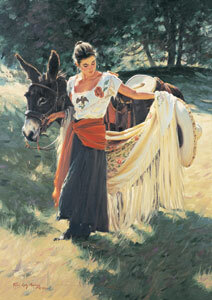 She would draw and redraw the same horse over and over again, trying to get it right. Her mother, a single parent of three, was encouraging but didn’t know quite how to help her daughter. “For her it was a mystery, because no one she knew did art,” Moyers says. Moyers’ self study and determination eventually paid off, and she was accepted into the Alberta College of Art in Calgary but left after one painful year. Abstract art was in vogue at the time, but Moyers wanted to paint from life. Not knowing what else to do, she signed up for interior design classes at Mount Royal Community College in Calgary, because someone told her that program included art classes. Sadly, there were more classes about window treatments than art. Once again at a loss as she should do next, Moyers took a series of odd jobs – from filling orders at a drug company to painting signs for K-Mart –but art was never far from her mind. 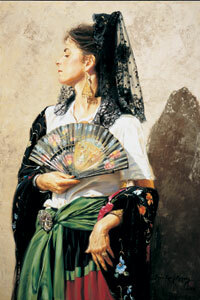 She eventually began to paint human and animal portraits on commission, and painted anything and anyone she could. When her mother passed away in 1978 and left Moyers a small life insurance policy, she used a portion of it to enroll in a summer workshop at the Okanagan Game Farm in Penticton, British Columbia. Suddenly, brilliantly, the light switched on. “The first day, I knew I found what I had been missing,” Moyers says. 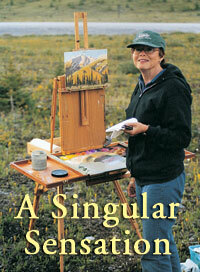 She was able to rub elbows and mix paints with artists who shared her love of painting from life. Among them was Clarence Tillenius, a representational wildlife artist, who recognized and nurtured Moyers’ talent. She felt primed and ready to go. Fortunately, there was a place to go. Tillenius encouraged artist Bob Lougheed to conduct a month-long session at the game farm each fall, sessions that attracted beginners like Moyers, as well as established artists like Ken Riley, Wayne Wolfe, Harley Brown, John Clymer, Dwayne Hardy, Randy Dutra, and Mel Fillerup. In 1979, the workshop also attracted a young painter from Albuquerque, New Mexico: John Moyers, son of Western painter William Moyers. The two young artists experienced a mutual attraction and began a long-distance relationship, then married a few years later and made their home in Albuquerque, later moving to Santa Fe, New Mexico. For 12 years they shared a studio and enjoyed working together, with one small exception: They couldn’t agree on what kind of music to play as they worked. She likes classical; he likes classic rock and country. When the couple moved to Pagosa Springs, Colorado, in 1998, they found they missed their community of friends and artists and returned to Santa Fe 13 months ago. They currently paint in separate rooms but plan to build a two-studio structure at their home once their house in Colorado sells. Even if they don’t paint in the same room any more, the two artists still rely on each other for critiques. “We’re not always happy to hear these things, but we almost always fix whatever the other person sees, and they’re usually right,” Moyers says. Living in Santa Fe gives them access to other artists’ eyes, as well, but often they rely on non-artist friends for feedback. “It’s a great way to see how the general public looks at art,” Moyers says. Their art, like their marriage, is a collaborative effort that requires balance, flexibility and teamwork. Moyers manages the business, for example, while John handles the framing and shipping. She arranges travel; he manages the props. When it comes to their 12-year-old son, Josh, however, they both proudly handle the parenting and enjoy having Josh accompany them on painting trips to Canada and throughout the West. “He’s the best little car rider I know,” Moyers says. Last July the family spent a month near Calgary, where Moyers and John happily painted from life. “Just being up there is very inspirational,” she says. “It’s the best there is.” It also can bring with it some not-so-inspiring elements, including rain and sleet that seem to come out of the blue in the Canadian Rockies—“Water and oil don’t mix,” Moyers says—and all manner of mosquitoes, flies, and gnats that stick to their paintings. The animals—moose, elk, and grizzlies—that frequent the fields where they paint, also can be of some concern. “I always make sure there are people slower than me between me and the bear,” Moyers laughs. Humans, too, can pose a hazard, as the Moyers discovered while painting near a road in the wilderness of British Columbia. A young boy, driving his father’s truck, came barreling down the road, out of control, when a wheel suddenly flew from the vehicle. “The truck was on three wheels, going back and forth, coming at both of us,” Moyers says. She climbed up and over an embankment to get out of the way. John, however, stood still, trying to gauge where the truck was heading before he started to run. He got out of the way just in time. The truck finally came to a stop right in front of his easel. Patricia O’Connor is a writer living in Albuquerque, New Mexico.